The Poroshell 120 columns give you speed and resolution like a sub-2 μm column with up to 50% less backpressure, for exceptional efficiency on your HPLC and UHPLC instruments. 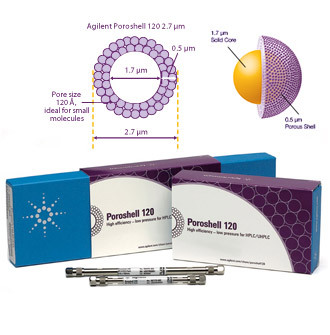 The Poroshell 120 family is expanding with now TWELVE chemistries available, including Poroshell 120 PFP as an alternative for highly polar analytes, halogenated compounds, and/or compounds with phenyl groups, and Poroshell HPH chemistries (HPH C18 and HPH C8) for high pH applications. Buy 3 Poroshell 120 columns and receive a 33% savings on all 3 columns. Use promotion code 9278 when ordering direct from Agilent. Offer expires Nov 30, 2014. Terms and conditions apply. Offer limited to three columns per customer. a 25% discount. Promo code 9212. Offer expires Aug 15, 2014. Terms and conditions apply. Receive a 50% discount on eligible ferrules when you buy a new self-tightening GC column connector nut. Limit of one pack of ferrules for each nut purchased. A FREE seminar designed to give you realworld knowledge that can be applied immediately in your lab. Please join us as our technical experts provide you with valuable tools to assist you in creating better chromatography habits to increase your productivity. Whether or not you have an Agilent LC or GC, this seminar is designed to get you the highest performance from your system. You are invited to join us for a half day or you can attend both the LC and the GC sessions. Registration is free but seating is limited. To guarantee your spot, register today!